Sampled this beer from a bottle well chilled in a tulip glass. A: Got an amberish clear color, pouring it out of a bottle into the glass gives it a nice little foam head, spinning the glass gives it lots of small carbonation bubbles. S: The smell is very pleasent, it got a malty tone with some smokiness and hints of sweet notes too. If you have tried other beers from Nynäshamn you will definitely recognize the smell from the malts used. T: The malty tones comes real nice, the smokiness found from smelling the beer is in the taste as well and grows larger turning into a nice bitterness. As with the smell you will also recognize this as a Nynäshamn brew from the malty tones. M: Nice small carbonation giving you that great thrilling feel on the tongue. Leaves you with a little bitterness at the end. O: A great bitter with the recognizable malty and little smokey notes that Nynäshamn often gives you. Great bitter. Soft malty start-grapes, caramel, oats. Dry bitter finish, with some lemony, grapefruity hops. Reallay nice, somewhere between and English and American style bitter, real tasty, aromatic, yet a little salty and earthy, pretty good balance. Thanks Per. Draught, Oliver Twist, Stockholm, Sweden. Light bronze colored beer with a full, wispy head that lasts. Woodsy, herbaceous and spicy hops in the nose with some juicy fruits. Nicely balanced. Lots of expression for its size. Hints of lemon and citrus with juicy fruits from the hops. A very nice bitter. Pours copper-orange, with a 1.5 cm tan head. Aroma is lemon, pineapple, coriander, starfruit, and these poisonous vines with beautiful-smelling flowers that people plant in their gardens in Sweden. Absolutely fruity and absolutely fantastic smelling. The mouthfeel is slick with low-medium carbonation. The taste is pretty much how I imagine those poisonous flowers would taste if they were not poisonous (imagine that!) and apples. Quite nicely sweet, lightly bitter (true to the English style as represented around Kent). Unlike any other bitter I've ever had, this one is ridiculously fruity, but I like it. Thanks to janM. It amazes me what talented European brewers can do with less than 5%. A pint bottle. Yellow body with tons of foam and lace that softens the tongue and offsets the carbonation. Expirey 12/07. A straightforward bitterness with some malt. More bitter at the end of the bottle. A midsummer night's drink. The colour is copper; the liquid is clear. The finger thick head sinks slowly to an off white thick lid, leaving some fine lacing. The smell is fresh and inviting: Sweet fruity flavours dominate, but there are also bitterness, some lightly roasted notes and touches of yeast and butter. The taste is bitter  is it really a bitter, I think it borders to an IPA  with lots of fruitiness and creamy sweet malt. The aftertaste is not as bitter, there are notes of butter, dried apricots and other exotic fruits, a mild sour-yeasty mineral taste with a touch of butterscotch. The carbonation is mild with some medium-sized short bubbles. The liquid is smooth. This is one of my top 5 when it comes to British pub style ales. And widely available in Sweden, too. Impressive head, leaving a thick layer of foamy lace. Clear and deep amber colored. A bit piney to the nose. Tastes close to the traditional English Pale Ales but less caramel base. The finish is moderately bitter. There's just a touch of yeast in the flavor as well. Picked this beer up in a smalltown Systembolaget. How it got there is a mystery. Anyway, Nynäshamns Ångbryggeri is an interesting small Swedish brewery that is turning oput some characterful beer. Bedarö Bitter has a nice (dark) golden color but pours with just a little foam. The well-developed smell is of sweet fruits, perhaps peaches, flowers, rasberries, 7-up and lime. The taste is predominantly bitter, sweet and bready. Unfortunately the bitterness is blocking the fruitiness. It's a very decent beer but perhaps a little too fruity for my personal taste. Brewed with Chinook and Cascade hops; Pale Ale, Crystal and wheat malts. A: Golden orange with a thinnish, yet large head. Some lacing. S: This is all about the hops. And just a hint of cloves. Nice! T: Yes, Hops Central. With the mild fruitiness of a good bitter. M: Rather filling on the tongue, less watery than other bitters with this ABV (4.5%). Dry (chalky) and smooth as it goes down the hatch. Drinkability: While I am not a hophead, I like this beer quite a lot (could it be the Chinook or Cascade hops? Or just the balance achieved with the malts?) This may not be a typical bitter, but it´s certainly a great one. Another solid brew from Nynäshamns Ångbryggeri. Purchased at the Foreign Beer Bar of the NWAF 2008, Manchester. BB 06/2008, served cool in a straight imperial pint glass. 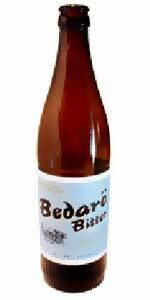 A: pours a pale copper hue, coming with a well-lasting, light beige frothy head and constant but moderate carbonation. S: the nose is utterly aromatic, with a yeast-hop mixture as of Belgian Ales - peardrops, sweet fresh longan-fruits (likely from crystal malts), lychee-like juicy hops, a touch of pine sprigs and flowery scent (apparently from American hops), muted but enticing banana-esters (from Belgian pale ales), and a very settled tinge of roast tea leaves. So vivid, complex, and delicious. M&D: creamy soft on the texture, medium-bodied, balanced, very well bottle-conditioned (I guess?)... All in all, I find this more like an American PA added with exotic yeasty twists and tremendous bitterness of an IPA - maybe it can be called an American Bitter? A wonderful beer anyway. taste: bitter european hops, spiced malts, rye bread, metallic, caramel, dry woody notes. Appearance: Golden brown with a thin white head. Mouthfeel: Dry and bitter with some malt in the bakground. This is a really good bitter and it is packed with flavour at only 4.5% ABV. Good stuff! Pours beautifully. Frothy thick crème head that stays. Nose is....beautiful. Nice spicy, hoppy, bitter thing going on. Flavor is quite nice. I love when I have a beer for the first time and the first sip turns into a gulp which turns into me downing at least 20% of the whole thing in one shot. Slight sweet tone rests over a bitter body. Man. This is one nice beer. A: Amber with a two finger offwhite head that stays. S: Citrus, yeast, malt, maybe a hint of dried fruits (raisins) and caramel.T: Hoppy bitternes that lingers, malt, fresh bread and a hint of yeast and citrus (lemon and grapefruit). Aftertaste fruity and bitter. M. Moderate carboration, above medium body. D: Very good. A very well balanced bitter. Nynäshamns Ångbryggeri (Steam Brewery) was started by a group of beer lovers south of Stockholm. Their reputation as microbrewery is very good, and although this is the first of their products I try I can see why. Their selection of beer styles shows a real interest in quality beers. Very drinkable and unfortunately very limited bitter. Sometimes the micro in microbrewery has it's downsides. Bitter, but with chinook and cascade hops, which may not be very typical for a bitter, but works very well. Served on-tap in Stockholm at Oscar Twist. Appearance is amber with a one finger head. This English bitter has a nose with pine, caramel, hops and grass. Drinking this bitter and I taste bread, grapefuit, malts and a good amount of sweetness. Its` mouthfeel is medium with a dry, bitter aftertaste, but one that is pleasant. It is a very easy drinking bitter and one that you could quaff a few of in a sitting with still having your wits about you. Nynäshamns Ångbryggeri (steam brewery) name all their brands after the local geography. Bedarö is an island outside Nynäshamn's harbour. Beautiful amber colour with a large beige head with an almost creamy texture. Good amounts of lacing on the glass. Hoppy smell of grapefruit. Hints of cloves can be noted in the background. Taste is bitter. Large amounts of grapefruit and gooseberries. Carbonation is low. Mouthfeel is smooth, yet somehow stingy. With the low ABV - this is a great beer for a skinny person like myself. Pours a copper color with a large white head. It lays down after a while, but remains until the beer is finished. Smell is malty, fruity and hoppy. Actually, the first thing I noticed was some wheat beer-like smell, and I looked on the bottle and they use wheat malt in this, so it was probably that I noticed. Spices, citrus, grapefruit, pine-needle is found. Taste is very good. The name says it all... it is moastly bitter, but at the same time, balanced with some sweetness from the malt. Notes of citrus, grapefruit and some pine-needle. Ends with a big bitterness. Slightly spicey with notes of wheat. Mouthfeel is very good for 4,5%. Filling, smooth with low carbonation and the liquid is medium-like. Dry! At first I wasn't very impressed by this one, but I've tried it a couple of times since then and I has really growed on me. Copper coloured with a nice large white foam that lasts until the beer is finished. Smells really nice! You can really notice the american hops by the pine-needle smell, amazing hoppiness! Taste is full on notes of pine-needles, grapefruit and of course some nice maltiness that makes it a really well-balanced beer. Great that it is so complex and interesting for the low ABV. Poured from a 50cl bottle into a goblet. A- Amber color with no head just a few bubbles around the edges. T- banana/clovey maltiness w a hint of hoppy bitterness. But really hollow in taste. I called it metallic hollowness. It left me wondering if that was all the beer had to offer. Really missing balance in flavor. O- This beer was very flat and hollow in flavor for me. Obviously it should be somewhat of a session beer given its style, but I didn't even want to have a second session - if that tells you anything. Pours a nice, clear copper with a nice fluffy head. The smell is floral, and fruity, with a nice bready base. The taste follows the nose, sturdy malt base, with clear and fresh floral and fruity notes. Hints of rye bread. The finish is long with a nice, balanced bitterness. Bubbly, livey carbonation, the liquid is very smooth on the tongue. This is one of Sweden's original craft beers, and a sold one at that. It isn't spectacular in any way, but a perfectly executed English bitter, that goes well with any kind of food, too. A: This beer pours amber into the glass, with a small white head that dissipates a little to soon. S: Malt hits your nose at first, then there is hops (I'm guessing Cascade and some other hops), fruit and a slight smell of smoked ham!? T: In the beginning there is hops, and only hops, both bitter and floral. After the first "shock" there is fruit and some caramell to this very dry beer. It's very fresh. The aftertaste is long with great bitterness. M: Slightly creamy and dry. D: Great hops, if you're into hops this is a must! Pour is transparent copper with tan head. Nose is grain, bread crust, fair amount of malt, sweet caramel, grassy resinous hop. Taste is bread crust, faint dough, sticky malt, sweet caramel. Hops are fading, pine and resin with a strong herbal grassy hop in the finish. Bitterness lingers on the heavy carbonation and a slightly syrupy body. On tap into a pint glass at Black & Brown. The beer pours a super dark and clear gold with good head and lacing. Nice pour...The aroma is super malty, way to sweet for my liking, almost like there was high fructose corn syrup...Not a huge fan of the taste sweet with an off esb esque bitterness, not bitter from hops. This beer was recommended to me by two different bar tenders so they must like it here. I don't think its anything special.